Passion, customer impact, focus, feedback and service are crucial for maximum subscription and membership growth. For an example, take a look at PopSugar and their subscription box, PopSugar Must Have. While I recommend you subscribe to learn more about building your own subscription program, here’s five “Golden Rules” you can use immediately from a recent interview with Lisa Sugar, PopSugar’s founder and CEO. PopSugar got its start with a simple blog about things Lisa Sugar was passionate about – celebrities and fashion. Because of her passion, she was able to pour herself into a business that just continues to grow. The amount of time it takes to oversee all the nuances of a subscription business can be overwhelming, and that’s where passion is needed to find the energy and focus you need to keep going. Lisa is a great example. Even with a team of more than 450 employees, Lisa is still curates each box herself. “Our editors are testing products all day long,” she shares, and she and her head merchant review each new product launch and new brand that her editorial team sends her way. She also frequents trade shows to scour the floors for ideas. That’s passion! “I like to say nothing in the box should go to waste, so if for any reason something isn’t for you, it would be a great gift for someone else. The idea is that you can really act and use everything and if for some reason you personally can’t, hopefully a friend or co-worker can, or you give it to somebody as a birthday gift later,” says Lisa. Member retention is the byproduct of engaging your subscribers so they continue to find value with your subscription. With PopSugar Must Have, members receive various seasonal offerings. They also get early access into knowing teasers for the next month’s box. These golden rules can produce staggering, successful results for you, like PopSugar. If you have a golden rule to add, please comment on this post! You may find yourself mentioned in a future article, and your input is always valuable. Lisa Sugar is the founder & president of POPSUGAR Inc, a global media and technology company that is parent to lifestyle media publisher POPSUGAR and monthly subscription box POPSUGAR Must Have. Together, these brands attract a monthly audience of over 100M visitors worldwide, as well as 3B content views and over 300M video views. Her book, POWER YOUR HAPPY: Work Hard, Play Nice & Build Your Dream Life (Dutton; September, 2016), chronicles what she’s learned on her journey building the company. Prior to POPSUGAR, Lisa served as a media planner at Goodby, Silverstein & Partners and at Young & Rubicam and began her career at Showtime and Fox. Lisa graduated with a degree in psychology and English from The George Washington University. She lives in San Francisco with her husband, three daughters, and two dogs – a Jack Russell Terrier and a Terrier Mix pup. 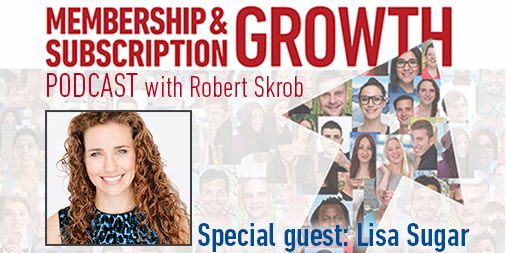 You can discover more from the full interview with Lisa Sugar on the Membership and Subscription Growth podcast. Subscribe to the podcast to discover the keys to recurring revenue growth from successful entrepreneurs in the subscription economy. Previous and upcoming guests include Robbie Kellman Baxter (author of The Membership Economy), Amir Elaguizy (CEO of CrateJoy), Dustin McAdams (CEO of PupJoy), Perry Marshall (Founder of Perry Marshall & Associates), Liz Cadman (Founder of MySubscriptionAddiction.com), Deena Bronz (Co-founder and CEO of KitNipBox), Tim Broom (Founder of ITProTV), and Georg Richter (Founder of OceanX)! Hi Robert, Thanks for providing these great podcasts. I have asked previously about any subscription membership plan. Can you please advise me of the details and costs. Thank you and all the best John Barnett.